A cooperation between Google Earth and the EAARL (Experimental Advanced Airborne Research Lidar), a mapping programme of the NASA, has made accessible, a tool for analyzing the advance of natural disasters and drawing conclusions for future protection. Google Earth is a programme by Google that any private or professional person can install on his or her computer. The programme manages a broad range of air photography, 3D modelling and geographical data, including a form of the yellow pages with addresses of restaurants, shops, etc. A place, an address or a name can be typed in, and the photo or 3D model is shown, this can be zoomed in on, and further data about the place can be demanded. There is a free version for private users and a commercial version for professional users, that can be used e.g., for architectural, urban and infrastructural planning, the choice of a site for a business, or for disaster prediction. 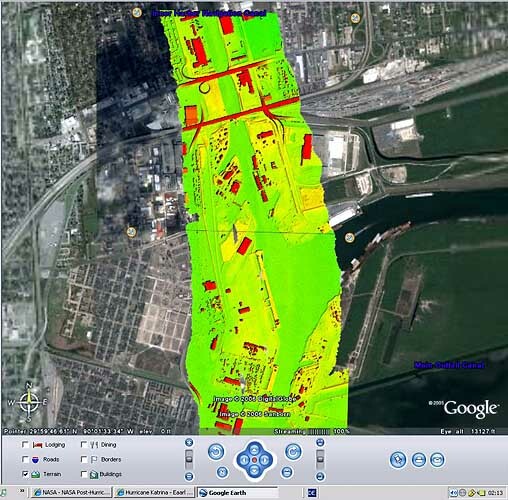 EAARL documents the changes on coasts caused by storms and flooding with air laser photography, which show e.g., what is under water, and height measurements, which enables users to perceive changes in the structure of the ground, EAARLthen places thees images on top of air pictures of Google Earth. By understanding the progression of floods, storms and the damages that they cause, has dramatic impacts, including the hope to prevent future disasters.